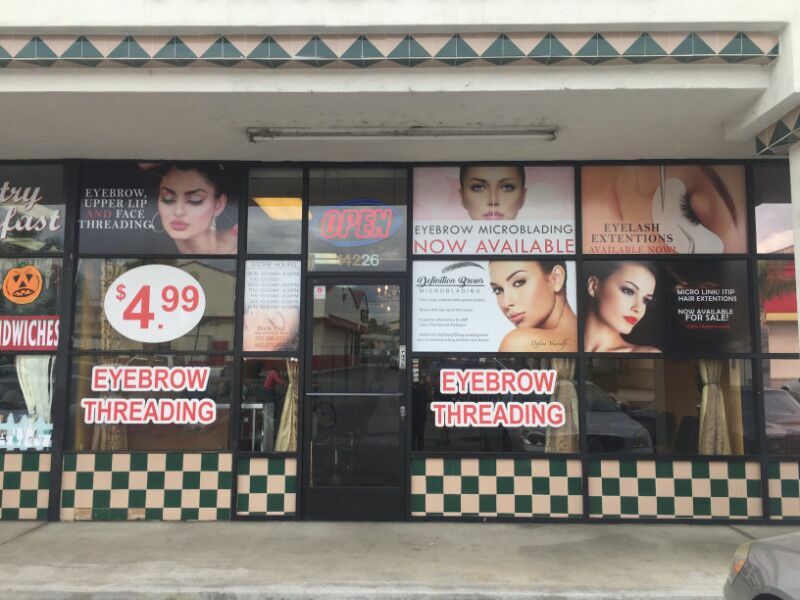 Located at 14226 Imperial Highway, Sophie’s Threading has a loyal following that grows by the day. 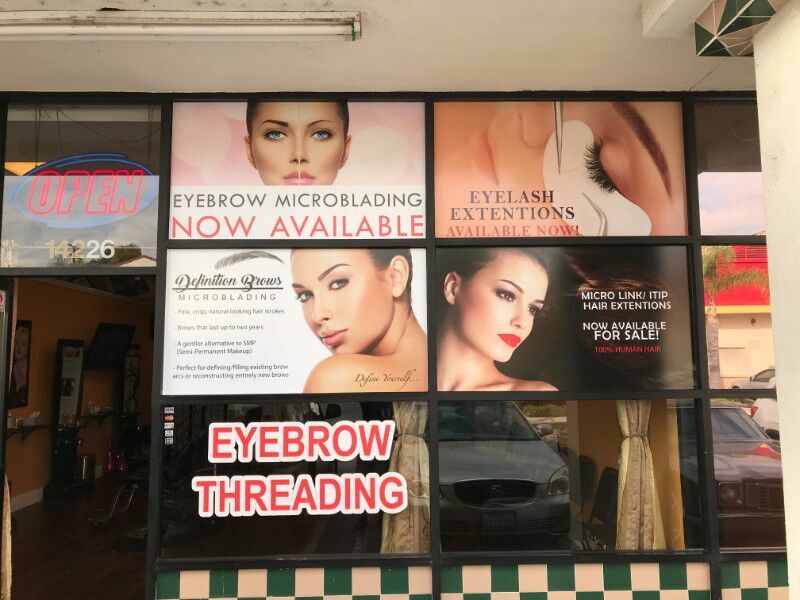 The business offers budget-friendly but excellent eyebrow threading, microblading, and associated services. In the past, the company featured basic lettering and numerals that advertised its most popular service. 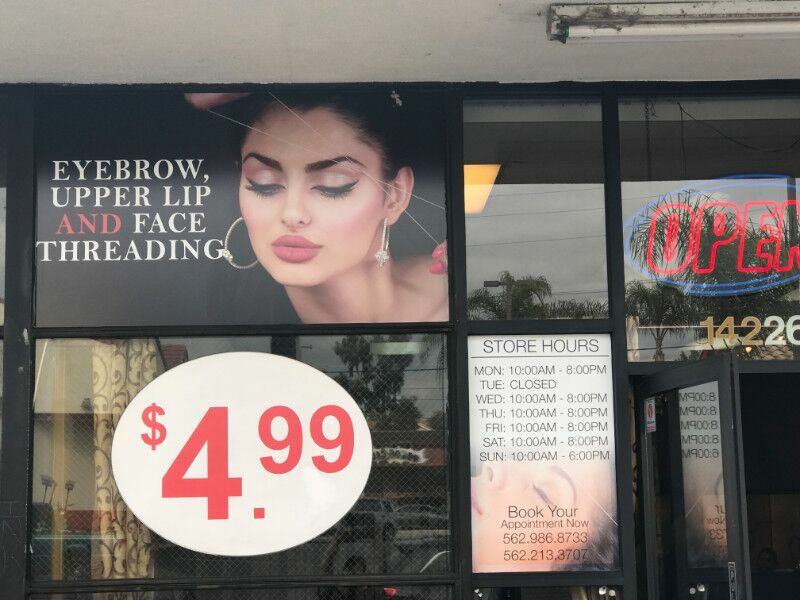 But when the management team decided it was time to boost brand awareness with window graphics and banner stands in La Mirada, a representative contacted our sign shop for assistance. Show off your beauty services with window graphics! It is interesting to note that we did not remove the graphics that were already in place. They are excellent at catching the attention of prospective clients. What we did was add images that display some of the work the experts perform at Sophie’s Threading. The graphics feature before and after pictures, underscore the advantage of eyelash extensions, and showcase the beauty that the services make possible. Banner stands in your lobby area explain your procedures! The banner stand allows for a text section that accompanies images. 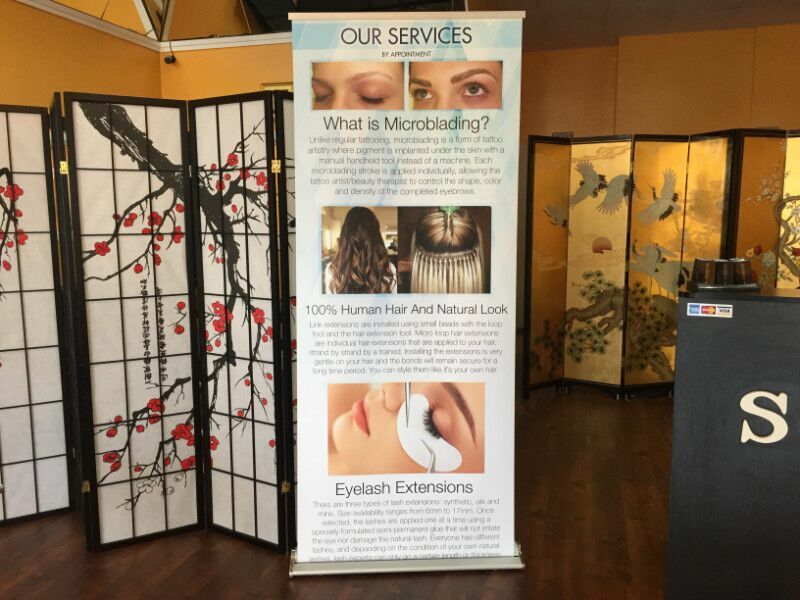 It answers questions about microblading and eyelash extensions. These are procedures that are not typically offered by many hair or beauty salons, which makes it essential to present the available services with some added details. Adding images to the mix is a good idea because it allows the customer to envision her or himself after receiving the treatment. The business’ management team placed the banner stand inside, next to the receptionist’s counter. If you have a storefront that does not seem to attract a lot of foot traffic, you might just need some eye candy. Full-color graphics can be precisely that – and more. When coupled with text, they explain in detail what your services menu entails. And this move has several advantages. Grab the attention of passersby! Brand awareness. You become known as the business that offers a specific service. Even if your competitor does the same thing that you do, you are the one who advertises the product. As a result, your name gets tied to the item or service. Name recognition. In the process of reading your marketing information, consumers cannot help but notice your name. Connecting your name to a particular color and font is crucial when you want to create name recognition. When you do it correctly, a consumer will fill in the blank after seeing only a specific color or font. Product knowledge. Do your customers know what you offer? Case in point is Sophie’s Threading. 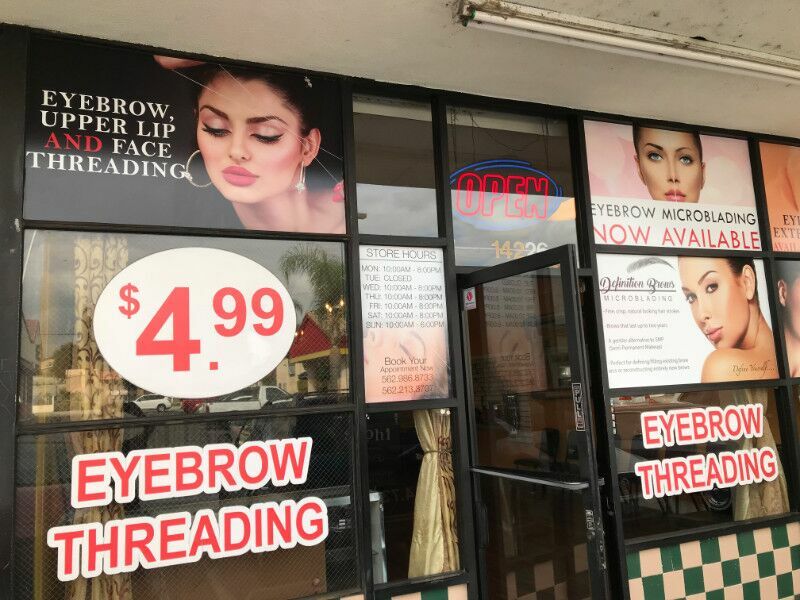 Sure, passersby probably figured out that the business provides threading services but may have been unaware about the microblading. Spelling it out makes the difference. Do You Need Window Graphics and Banner Stands in La Mirada and Nearby Areas? Ready to add retail signage to your store? Putting images in your windows is an excellent advertising tool. Colors and shapes combine to become the type of eye candy that few consumers can resist. Banner stands are ideally suited as menus, for the lobby, as traveling advertisements, and as mobile marketing information. Place them outside your store or inside for customer information. If we have piqued your curiosity about these signage combinations, discuss your thoughts with our graphic artists. We gladly assist you with the creation of your very own signage solution. Call us today to get started!